August 19, 2013 – ViaSport’s Fall 2013 grant intake period opens today with several funding opportunities now available for sport in BC. For more information on each including grant guidelines, application forms and dates for future intake periods, see the links provided below. The Aboriginal Youth Sport Legacy Fund (ASLYF) supports programs which encourage BC’s Aboriginal youth to participate in physical activity and sport. Apply now! The Hosting BC grant program provides funding to sport event organizers to facilitate sport, economic, social and community development. Since 2004, over $4 million has been invested in 470 sport events in communities across BC developing a legacy of sport hosting expertise. Apply now! The Local Sport Program Development (LSPD) Fund allows community sport to be more accessible to people of all abilities by providing funding support to sport programs initiated by municipalities, sport organizations and Aboriginal communities. Apply now! Founded by ProMOTION Plus, the Girls Only and Forever Active Bodies (FAB) 55+ grants are part of an overarching grant fund geared towards the development of sport opportunities that inspire girls and women to get active in BC. A program with two available categories, Girls Only focuses on supporting girls and women of all ages, while FAB 55+ is limited to women aged 55 and above. Apply now! Have questions? Inquiries may be forwarded to the ViaSport Grant Team at grants@viasport.ca. Eight Fraser Valley individuals were honoured last week with a PacificSport Fraser Valley Recognition Award at the 2013 ceremony. Nominated by their peers for his or her contribution to community, sport and/or athlete development, this year’s recipients are an accomplished group including Athletics coach Tom Nielsen and athlete Mike Mason. Originally from Nanoose Bay, high jumper Mike Mason relocated to Abbotsford in order to train under “Coach Ziggy” before London 2012. Mason had a stellar junior career, including a world junior championship gold in 2004. At the senior level, Mason has represented Canada at Commonwealth Games and World Championships, as well as both the Beijing and London Olympics. Mason had top 10 finishes at the 2008 World Indoor Championships, the 2010 Commonwealth Games, and most recently the 2012 London Olympics. The road to London was not easy for Mason, who had to battle back from an ankle injury just to make the team. He overcame his injury in London, posting a strong 8th place finish. During this time, he completed a degree at UBC and continues to train and compete for Canada. BC Athletics would like to congratulate both Tom and Mike and wish them continued success for the future! RICHMOND, BC (May 15, 2013) – ViaSport and Sport BC will honour nine dedicated sport leaders from Trail on Wednesday, June 5, 2013 with the Community Sport Hero Awards presented by Teck. The public award ceremony, hosted at the Best Western Plus Columbia River Hotel in Trail, celebrates the contributions of long-time community sport volunteers. BC Athletics would like to congratulate Ocean Athletics founder and Head Coach Maureen de St. Croix on her recognition at the YWCA’s 30th Annual Women of Distinction Awards in Vancouver on Tuesday, May 28, 2013. Maureen was chosen as the winner in the Health, Wellness and Athletics category. Maureen was one of nine nominees in the category. Other nominees included Kathy Newman – Retired, BC Wheelchair Sports Association, Wendy Pattenden – CEO, Canadian Sport Institute Pacific, Cathy Priestner Allinger – Chair, viaSport and Laura Watson – Sport Development Lead, viaSport. 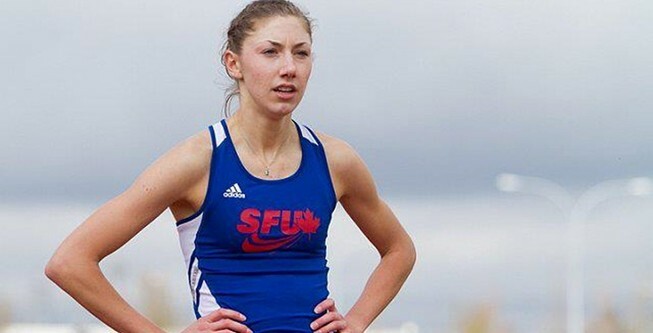 May 20, 2013 – New Orleans, LA – Simon Fraser University track and field runner Helen Crofts (West Vancouver, BC) has been named the west region female track athlete of the year by the United States Track and Field and Cross Country Coaches Association. The senior is the Division II leader at 800-metre heading into the NCAA Division II Outdoor Championship with a time of 2:04.53 to lead by more than three seconds. It is also the sixth ranked time in the event in Division II history. 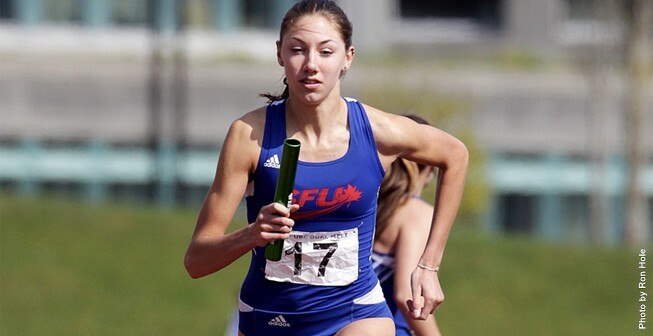 In addition, Crofts is also ranked seventh in the 1500-metre posting a time 4:26.85 and 10th in the 400-metre with a time of 54.46. She won the Great Northwest Athletic Conference Championship in both events and is also a member of the Clan’s NCAA Division II eighth seeded 4×400-metre relay team. Crofts and the Clan will travel to Pueblo, CO this week for the NCAA Division II Outdoor Track and Field Championship beginning on Wednesday.